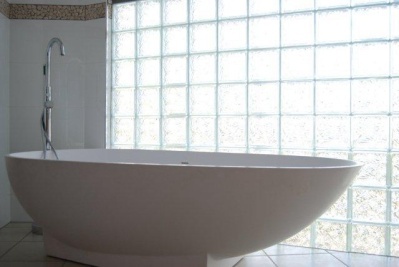 Glass Block or Glass Brick (as they are sometimes called) walls are now affordable to the average handyman. 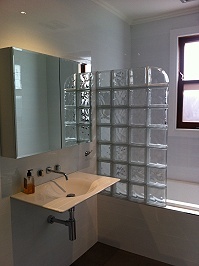 Here at DIY Glass Blocks we supply you with the full kit to build your own internal or external Glass Block wall. In today's modern architectural homes and buildings Glass brick walls are effective in generating open spaces and light whilst offering security and privacy to areas like bathrooms and sun rooms . Glass blocks allow you to bring the outside in without the noise and pollution sometimes surrounding them. Glass Brick Kits include Everything. Our Easy Finish kits include the glass blocks, separator strips, wall anchors or external frame as applicable, glass block adhesive and glass block silicon sealant. This means that you the handyman or builder need only supply labour and some frame fixing screws. Energy Saving - Glass bricks are hollow inside , this provides for greater heat insulation, better than double glazed glass. Hence the Glass Block is an energy saving building material. Various patterns permit for light control from transparent and non-transpartent, allowing choices in your applications. Reduced Noise - Glass bricks offer better noise reduction than double glazed glass panes. More agreeable environment- transparent and semi transparent glass blocks permit viewing of the outside environment whilst negating the need for curtain and blinds, hence removing the "trapped" feeling offered by traditional glass pane windows and curtains. Internal or External walls and windows - Glass blocks are suitable for internal or external applications. No painting - a glass brick feature wall needs no painting, our external wall frames are powder coated for long life. Choose if you require the full kit or just the installation kit. Choose if internal or external application. Select the width of the wall. 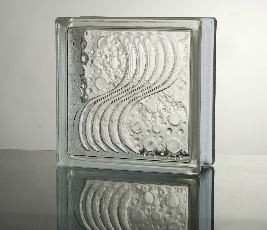 Select the glass block style. We ship generally next day. Here at DIY Glass Blocks we use the Silicon System, this allows DIY builders and Handymen, to build walls and panels that look professional and attractive in the fastest time. 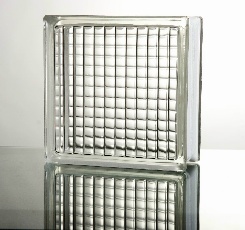 Our special Glass block adhesive silicon is used to bond the glass bricks to the separator strips and each other. This system relies on smaller gaps between glass bricks and a more appealing finish.